The Back Ward (裏病棟) of the Hospital, full of children, IV drips and heart monitors. 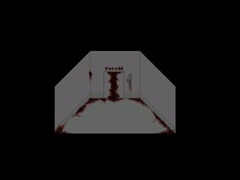 The player can reach this area from the Hospital's Morgue. They will arrive at a short hallway, as dark as the Morgue, with five seemingly healthy black-haired children. The children properly react to the Whistle and can be killed with the Iron Pipe, but they completely ignore the Handgun. 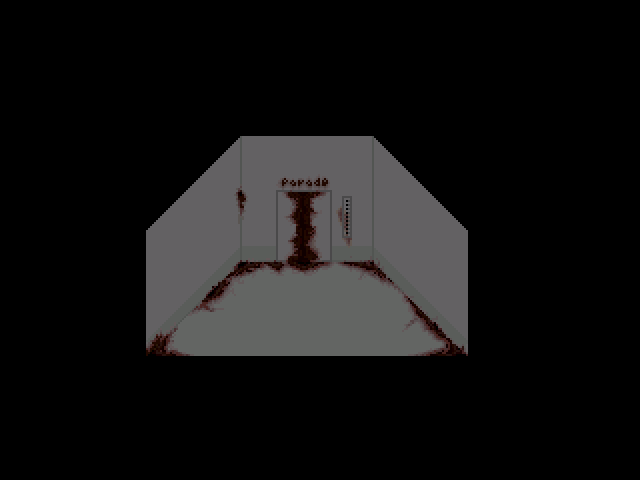 The leftmost doorway in this area leads back to the Morgue, the door to the right of it leads further into the Back Ward, and the rightmost doorway, which is surrounded by heart monitors, teleports the player to the Illusionary Corridors. By proceeding into the Back Ward, the player will arrive to a passage, still dark, but with a big number of IV drips and two more black-haired children. 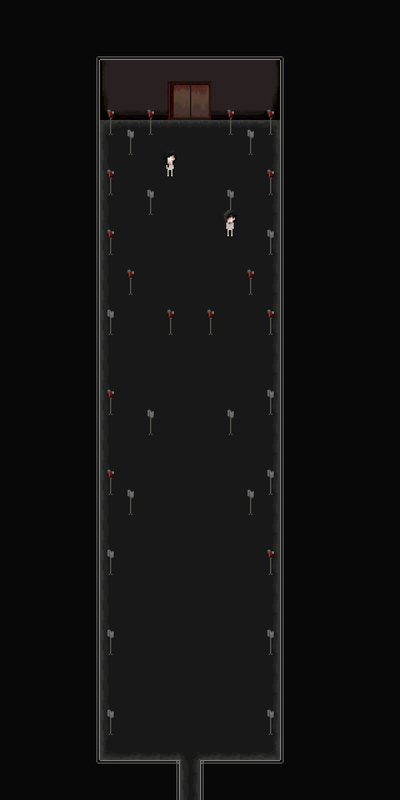 The passage ends with an elevator which takes the player to the Parade Ward (パレード・病棟). The Parade Ward is a white bloody hallway with faulty lighting. Occasionally, a Kaibutsu laugh can be heard here. There are plenty of IV drips, heart monitors and dead children in this area, and it contains a couple of Fetuses when visited by Rust. Some of the children are alive, but most of them look seriously ill. These children ignore the Handgun and the Whistle, and they are not frightened by the Iron Pipe. They still can be killed, but do not give any money, and their dead bodies stay in the place where they were hit. If the player leaves the Parade Ward but comes back in the same flow session, the dead bodies will instead appear on the spots where these children initially spawn. However, the children will go back to life when the player wakes up. 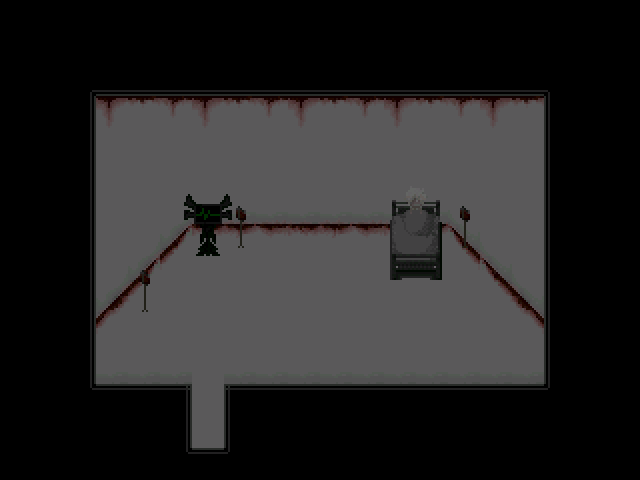 The only door in the Parade Ward leads to the Rust (錆) room, which contains a single bed with a little Sabitsuki lying on it. She appears healthy at first, but as the player's Erosion counter goes up, her condition becomes worse. Once the counter reaches 100 points, it is possible to get the Rust menu type by interacting with her. There is also a red mark on the wall at the end of the Parade Ward. It is possible to hit it with the Iron Pipe, which opens up a hole in the wall, but trying to go through it will force Sabitsuki to unequip her current effect. When this area is visited as Rust, however, the hole is fully open and it is possible to go inside, which leads to the Rust's version of the Blood, Pus, Rust room. While it is quite plausible that the child in the Rust room is little Sabitsuki, it is not outright confirmed in the game. A child at the end of the Parade Ward was invincible in version 0.15. They did not die if hit with the Iron Pipe, because they trigger a different death switch than the one that was used to determine whether they are dead. They used the death switch which was triggered by another child, and could not die as long as that child was alive. This bug was fixed in the following versions of the game. The Back Ward could symbolize a timeline of the facility. Initially the children are fine, however, as time goes on (and the elevator goes down) things start to take a turn for the worse and the children are dying. The word "parade" could be a mistranslation of "exhibition", as in a display of the different medical cases that the patients have. Both words are almost synonymous.